Last week was Halloween and I had a little party at my house with my brother, his wife and their kids because my kids were desperate for Halloween anything. I saw a version of these broomsticks so many times all over pinterest, but they used pretzels and since I couldn't source gluten free pretzels I wasn't going to do them. However, walking down the gluten free isle I spotted rice sticks and thought I'd see if they worked. And they did! All you need to make these is rice sticks or pretzels, cheese sticks (they stringer type ones) and chives. I cut the string cheese into thirds, so one cheese stick would do 3 broomsticks. I cut the rice sticks in half as they were fatter than I expected, then I pushed them into the cheese, peeled the cheese and tied a chive around it. 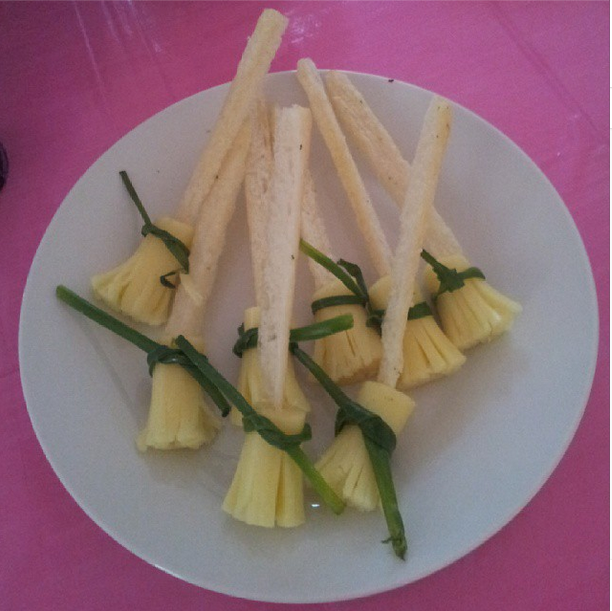 A little fiddly and some of the sticks broke, sometimes the cheese split, but they were worth it.